Bright, colourful and futuristic looking, Illuminous is 5 reel, 20 payline video slot created by Scandi developer Quickspin. Highlights here are the respins and free spins, both of which come with plenty of extra wilds. Play on all devices from between 40p and £80 per spin. There’s a fresh, glossy feel to the design in Illuminous. As you’d expect given the title, the dark reels are dominated by brightly coloured symbols. You’ll see the usual lower value A to 9 playing cards joined by 4 higher value gemstones. The best of these is the pink diamond which pays 12.5 times your total bet if you land 5 on a line. The gold W is the wild. It replaces all the standard symbols and also offers awards of up to 12.5 times your total stake. The standard wild is joined by the Bonus Wild Scatter. It offers the same awards as the normal wild but also triggers the game’s 2 extras. Hot Reel Respin feature – this is triggered if you land 2 Bonus Wild Scatters on the same spin. The reels which featured the Bonus Wild Scatters from the triggering spin turn hot with extras wilds added during the respin that follows. Land another Bonus Wild Scatter and another respin is added to your total. Hot Reel Free Spins feature – you’ll need to land 3 Bonus Wild Scatters to trigger this round. The process is the same as the respins. Instead of a single respin though, you’ll get 5 free spins with the Hot Reels and extra wilds in play. Landing an extra Bonus Wild Scatter adds an extra free spin to your total, complete with added wilds. This video slot isn’t as fiery as some in the Quickspin catalogue (we’re looking at you Hot Sync). We’d put the variance here in the low to medium range. You can expect plenty of play for your investment here and maximum wins of 404 times your bet on each spin/respin. As usual for a Quickspin game, the design in Illuminous is very nicely done. There’s a glossy feel to the visuals and the synth heavy soundtrack gives the game a futuristic feel. 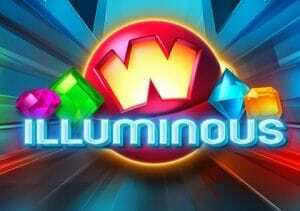 If you’re after a simple, low variance game then you should find Illuminous an enlightening option – a good alternative is NetEnt’s Starburst.